Debamitra started teaching Odissi at a very early age of 20 at Gurukul, a premier school of classical dance in Kolkata. Debamitra groomed students at Gurukul for over a decade and became very popular as a teacher. Teaching is indeed her forte; She enjoys teaching as well and thought of starting an academy of her own which will be distinctively different. Thus Kolkata Mayur Lalit Dance Academy started with an aim to groom dance lovers and produce perfect passionate dancers, not just performers. Students are given lessons on Natyashastra from a very early age. Along with traditional Odissi items choreographed by Guru Kelucharan Mohapatra, choreographs by Debamitra herself are also being taught here. Students are encouraged to compose and choreograph on their own to enhance their creative skills. 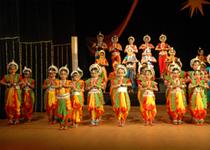 Apart from regular training of Odissi, lessons in Classical music and Pakhawaj are also imparted in annual workshops of the academy so that the children have definite knowledge in music and rhythm along with dance which are inter-related. Lessons in Yoga are given from the very first day to acquire physical fitness and suppleness which are very essential for a classical dancer. 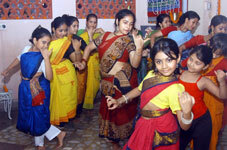 Students are also equipped with the knowledge on techniques of dance related make-up, costumes, hair-styling, stage craft, thus grooming into a complete dancer after 10 years of rigorous training. Mayur Lalit started its journey from November 1, 2004. The academy aims at training students to be well versed in the language of classical dance so that they can face knowledgeable audience. A student taking admission in the academy is either placed in the junior or senior group as per ones ability and passion, age and previous experience plays no role in deciding the category. Mayur Lalit is government registered organization under ‘The West Bengal Societies Registration Act.1961 and affiliated with ‘Pracheen Kala Kendra’, Chandigarh. For all learners - Strict regime of exercise and yoga to build necessary body fitness. An agile and flexible body helps to perform better, for this ‘anga shudhikaran’ is essential. 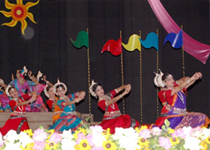 Basic dance techniques and 5 Odissi items, on completion of which they can do ‘Mancha prabesh’ (Solo recital). For advanced learners - Along with exercise and yoga, the curriculum includes basic dance techniques and 10 advance dance items.